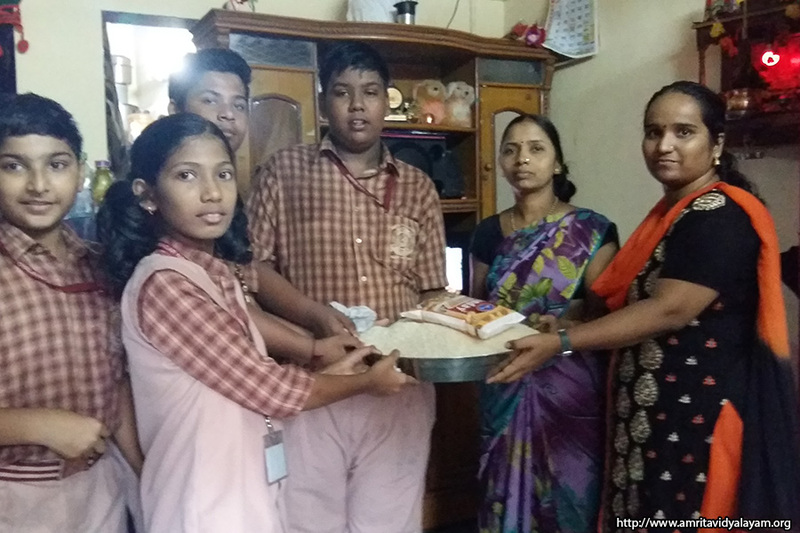 Students along with their teachers set out to meet their respective adopted families with great eagerness. Their spirit is really worth mentioning as they diligently brought fistfuls of rice to school every Monday. The school collected around 190 kg of rice this month alone, along with generous donations of clothes and money from students as well as teachers. 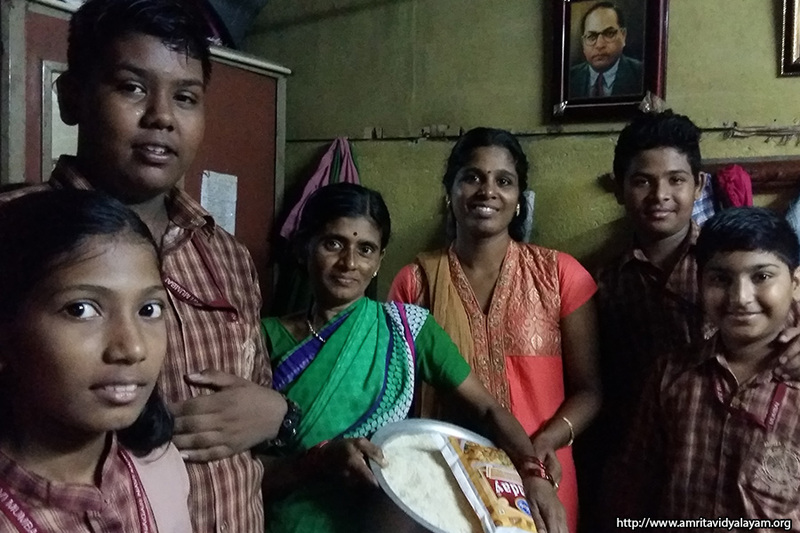 Each family received at least 6 kg of rice. The money collected from the ‘Sealing of Desires’ project this month helped to buy oil for the families. The families were familiar with the students and welcomed them warmly and even offered them water. 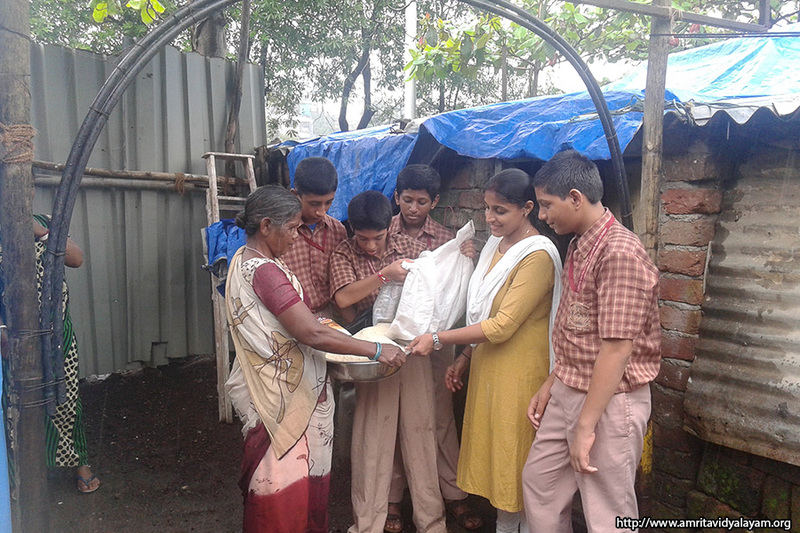 The students are able to understand the turmoil faced by these families where one earning member has to feed 8-9 mouths. It was especially disheartening to see young children without any toys to play with. It was a wake-up call again to our students who felt that they are privileged to be receiving the luxuries provided by their parents. A sight that especially touched their hearts was that of a family with a newborn baby (3 days old) who was struggling to take care of the basic necessities of the infant. 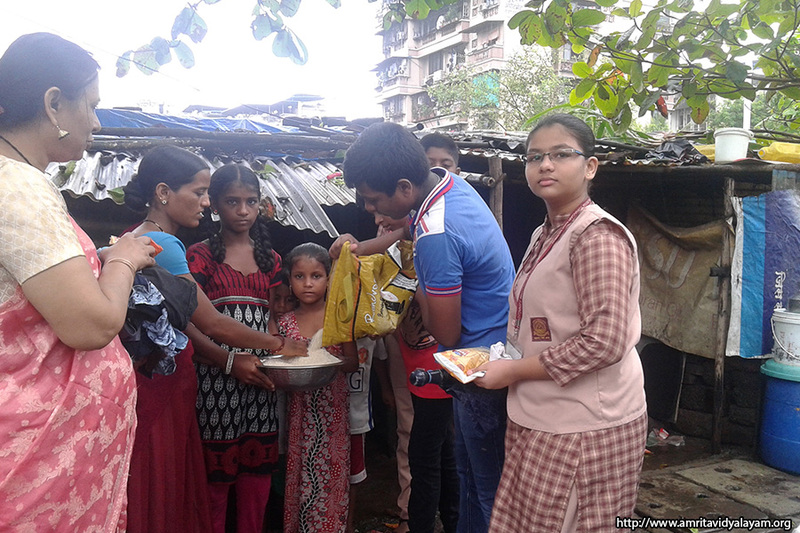 This family was not adopted by the school, but the teachers felt that the mother deserved to be given food in order to sustain herself and her baby. Principal Brni. Rekha readily agreed to provide bedding and basic necessities for the mother and baby. One of the students observed that although the Sevamritam Project does not eliminate the suffering of the people entirely, it at least “adds some joy and subtracts some sorrow”. We are very fortunate that Amma guided us to reach out and spread a little bit of cheer to needy families, especially during this festive season.